Today, I would like to share a very special make to me. 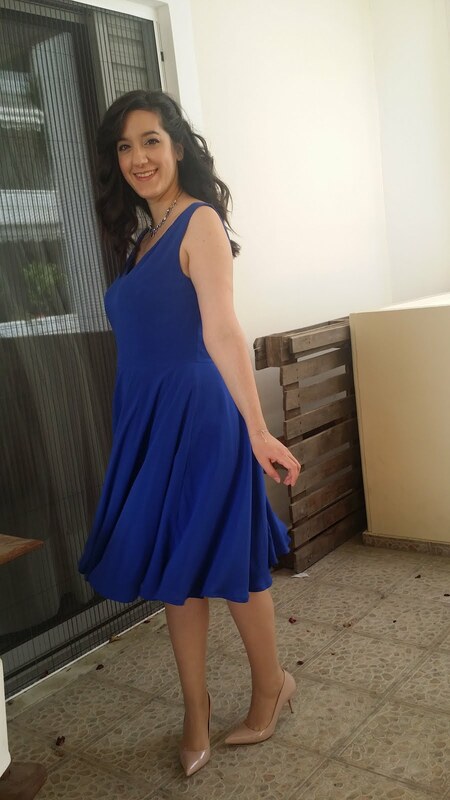 The dress that I made to wear on my son’s baptism day! 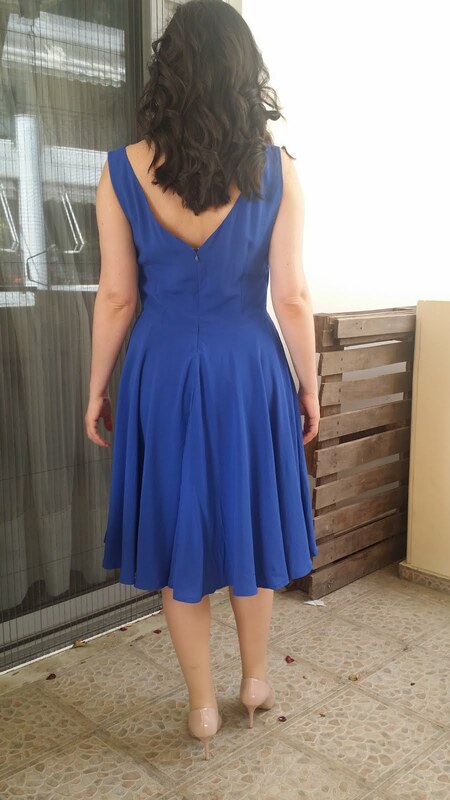 I sew a Betty dress by Sew Over It (SOI). Guys..I’m so in love with it! I’m really proud with how it turned out! 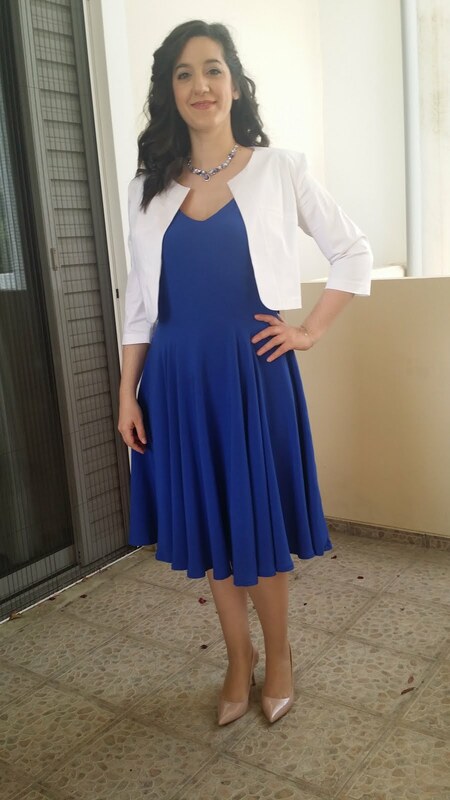 I was between the Betty dress and the Silvia dress by Salme. The plan was to sew both dresses and then decide which one I would wear. 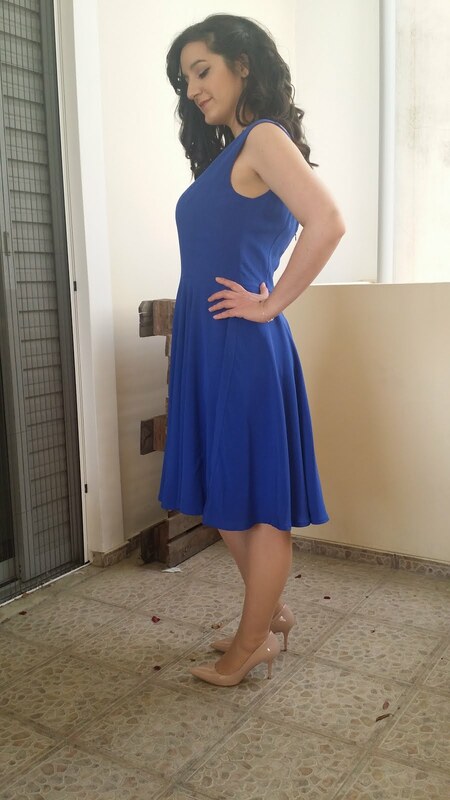 But I sew first the SOI dress and I was so happy that I didn’t even start making the other dress! However, Silvia dress is a pattern that I wanted to make for a long time. I hope I will make it soon. On to the beautiful Betty dress now. 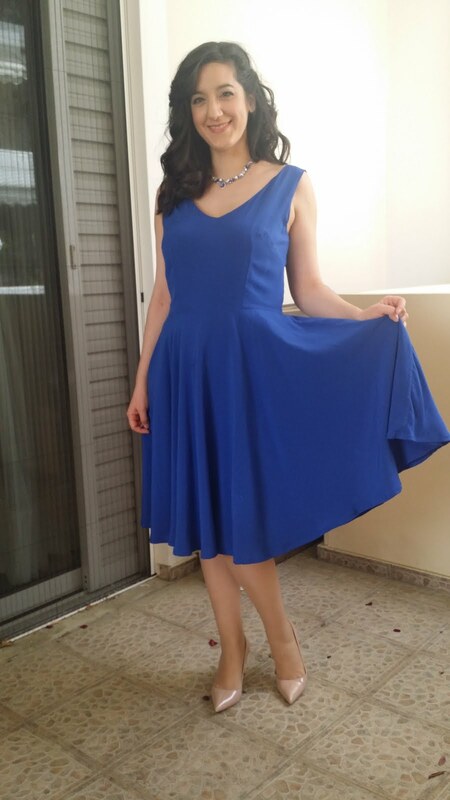 This is a 1950’s inspired sleeveless dress with a fitted bodice. There are two bust darts and four waist darts (two at the front and two at the back of the dress). 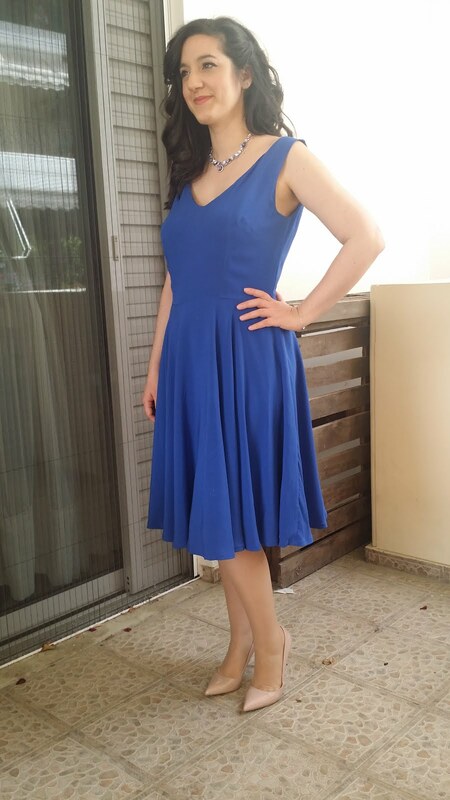 The dress has also a full circle skirt and it fastens at the centre back with an invisible zipper. A new addition to the pattern is the “Betty dress add-on pack” which includes sleeve and neckline variations. I made the V-neck sleeveless variation. I chose this beautiful viscose fabric in a royal blue colour (from ifasmaeu, 6 euros per meter). 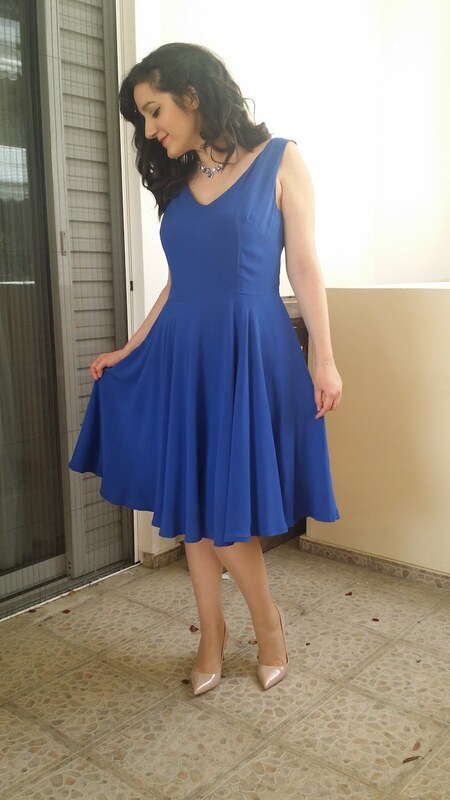 I wanted my dress in a solid colour which in my opinion looks more formal. I bought 3 meters as the pattern requires; I ensure you though that I must have about half a meter of leftover fabric. Also, I lined the dress to make it more comfy and precious to me. I used 3 meters of a viscose lining fabric (from ifasmaeu for 4 euros per meter). Threads and 45cm invisible zipper were bought from my local haberdashery. I made the size 12. When I use SOI patterns, I often have to move the bust darts downwards in order for the garment to fit me properly. So that, first I tissue – fit the pattern, in order to see how it fits and at the same time to check those darts. Thankfully, I realised that everything was sat at the right places (darts and waistline) on my body! Yay! I’m really pleased with the fitting of the dress. Tissue – fitting is when you put pins on your pattern pieces across the seam allowances. That way, you actually pin your darts, shoulder seams and side seams so you are able to “wear” your paper pattern and see how it fits. 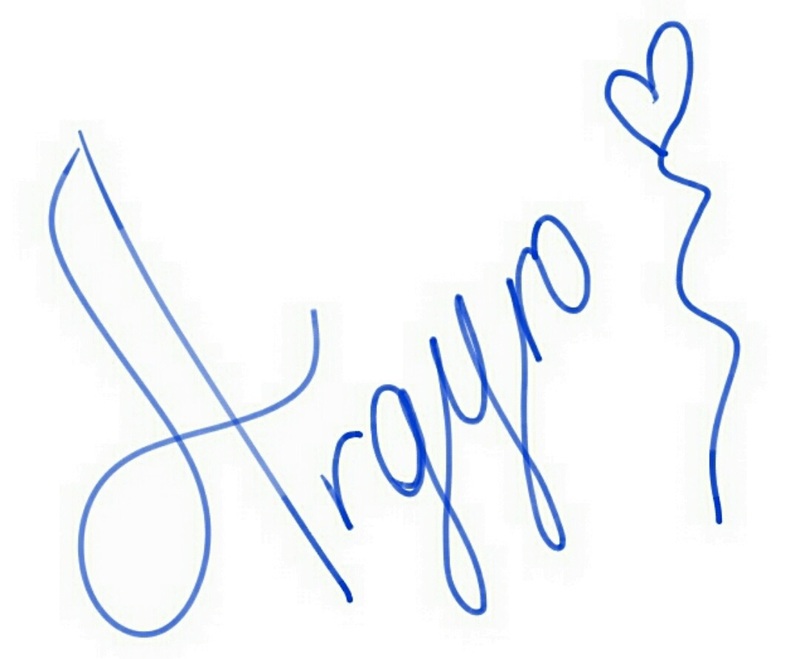 A litle note here. 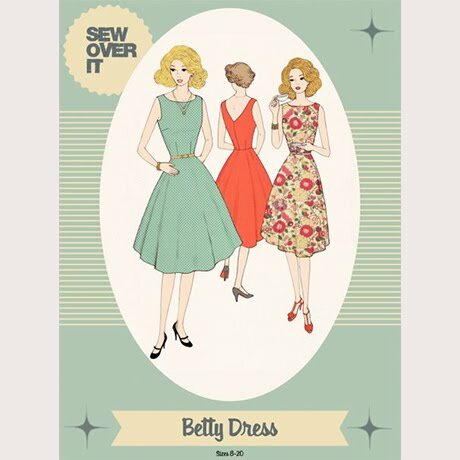 I purchased the Betty dress pattern as a pdf. I always trace my patterns whether they are printed pattern or pdfs. For the tissue – fitting technique I mentioned before, it is better to use a thin paper (tracing paper) and not thicker paper than this in order to check the fit right. Like I mentioned at the past, I’m not an expert. I just share what I have learned through sewing and what works for me. To continue, I made the lining of the dress first and then I sew the outer dress. I attached the lining and the main fabric straps from the inside. Same technique I used on my Kim dress. So there is no visible seam allowances either side of the straps. An issue that I had was that the zipper that I have set in was longer than what it was recommended. As a result, it was puckering at the back. I decided to unpick about 5-6cm of the sewn zipper and remove the leftover part. The final result was waaay better. After, I hunged my dress about one day or two, as the circle skirts requires, then I had to even my skirt’s hem. This part is where I struggled the most. The hemming of this skirt! Guys!! That was insane! I almost got mad until I had made the hem even! It was really frustrating! I was cutting and cutting all around the skirt but thankfully the skirt was pretty long. Otherwise, I would have ended up with a super mini skirt! Haha! Seriously, the hem kept staying uneven whatever trick I was trying. I starting searching online for some answears and guides about this issue. First, I tried Megan Nielsen’s method and I put my pattern piece on the skirt and cut any left fabric under the pattern. Unfortunatly, this didn’t work for me. Maybe I didn’t do it correctly. Then, I watched Gertie’s YouTube video on how to hem a circle skirt. The video was amazing but she used a dummy for that, an important feature that I do not own! Haha! 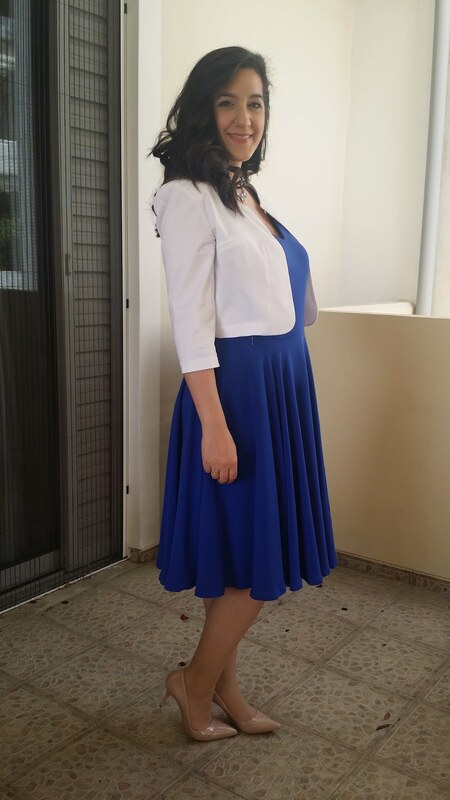 Finally, I read somewhere that the best method to even a circle skirt hem is to mesure the desireable length from the waistline to the hem all around. Inch by inch. This process was really time consuming but aghhhh…! Thank God, it worked! The final result was perfect! 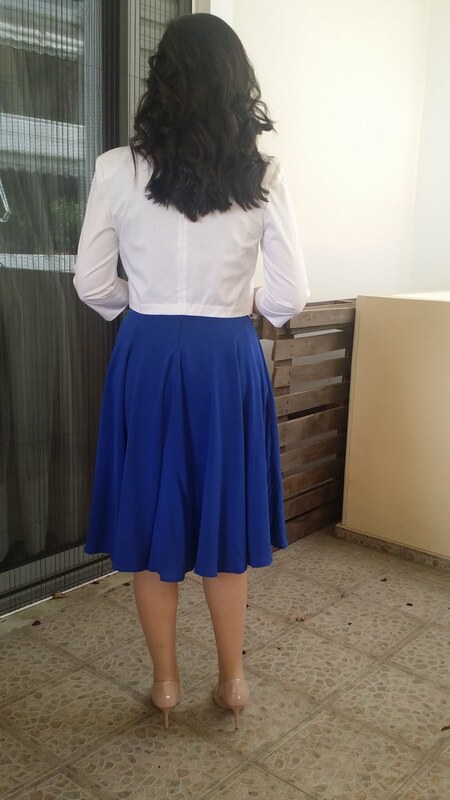 My dress’s skirt mesured 61cm from the waistline to the unfinished hem. I stiched a line at 0,7cm all around the hem – a trick that I learned from By Hand London and Colette blog – and I folded once there twice. So I double hem it. 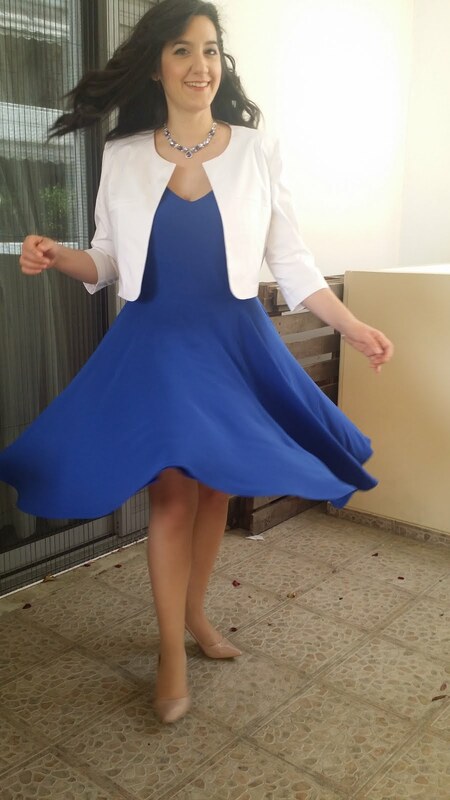 I looove twisting around in my circle skirt dress!! Another part of the construction that I found it challenging was to under stich the lining onto the seamallawances. It was quite difficult to reach all those edges. I lala-love this dress! 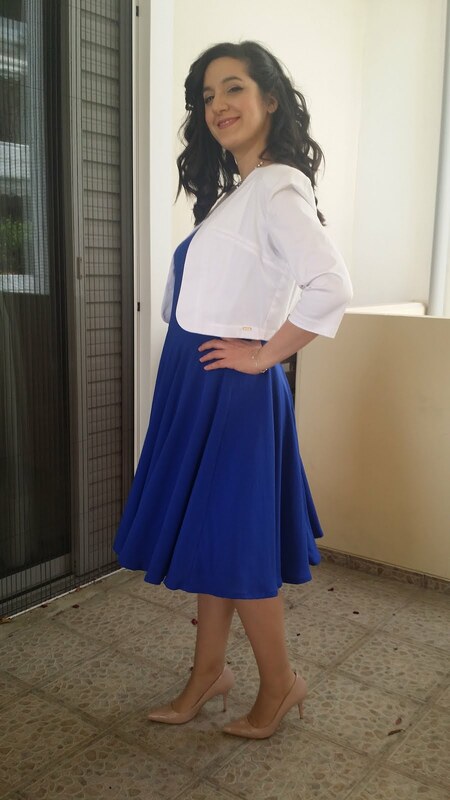 It is the first special occassion garment that I sew so I’m very proud of that! It is adorable and I totally recommend this pattern to you! The day I wore it, was a bit chilly so I had to wear a jacket, something that I actually didn’t plan. According to the weather news it was suppose to be a sunny and warm day. What I’m trying to say is that unforunally the jacket in not handmade. I bought it the day before. If I had not only time but also did know that I would wear a jacket, I would love to had sewn the Morris blazer by Grainline or Coco jacket by SOI! The thing is that the last one has not been released as a pattern yet. It is only a class for now. I’m looking forward to this release. I kept this photo for the end! A really funny one! Haha! I continued twirling around! Fabric: Viscose in royal blue (main fabric – for 6 euros per meter) and Viscose lining fabric for the lining (for 4 euros per meter), both form ifasmaeu. Alterations: I lined the entire dress instead of lining only the bodice.I shorten the skirt about 8cm.